Harper and Patchen (1996, their fig. 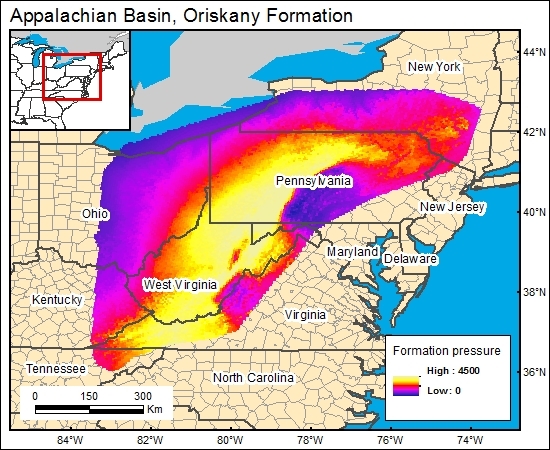 Dos-11) presented a graph showing original reservoir pressures versus drilling depth for 68 Oriskany fields and pools in New York, Pennsylvania, and West Virginia. Although there is some scatter, their data indicate that pressures follow the hydrostatic gradient of 0.44 psi/ft. To derive a pressure-distribution map for the GIS, we multiplied the formation depth by the pressure gradient (0.44 psi/ft) (c12boriskanyg). Harper, J. A., and Patchen, D. G., 1996, Play Dos: the Lower Devonian Oriskany Sandstone structural play, in Roen, J. B., and Walker, B. J., eds., The atlas of major Appalachian gas plays: West Virginia Geological and Economic Survey Publication V-25, p. 109-117.